Huddersfield Town boss David Wagner said his side are halfway to Premier League survival after their 4-1 win at Watford. This was the Terriers' first victory in eight away league matches and took Wagner's team up to 11th in the table on 21 points. Huddersfield are playing in their first Premier League season after winning the Championship play-off final in May, but their latest success was their sixth league win of 2017-18 after victories over Crystal Palace, Newcastle, Manchester United, West Brom and Brighton. "We are in the race [to stay up] and nobody thought we would be - this is what makes us happy," said Wagner. "You need 12 wins I believe to stay up and we have six. "We played well, scored some wonderful goals and had other opportunities - the players performed to their best." 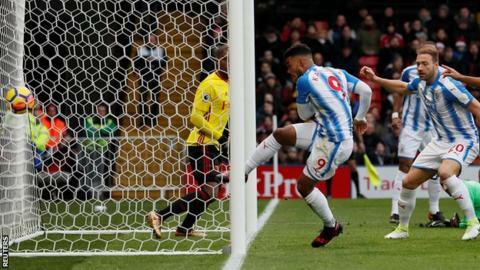 Huddersfield's Elias Kachunga scored his first Premier League goal when he tapped in after Watford had failed to clear a corner. The visitors doubled their lead after only 23 minutes when a cross from the excellent Collin Quaner hit Aaron Mooy six yards out and went into the net. Hornets captain Troy Deeney was shown a straight red card for a lunge on Quaner in the 33rd minute and Huddersfield added a third when Laurent Depoitre capitalised on a slip from Jose Holebas and smashed the ball past Heurelho Gomes. Huddersfield skipper Jonathan Hogg was dismissed for two bookable offences and Watford's Abdoulaye Doucoure pulled a goal back with a superb 25-yard half-volley. However, the visitors added a late fourth as Mooy grabbed his second goal when he converted a penalty after Doucoure fouled Depoitre in the area. Huddersfield started the Premier League campaign with a 3-0 win at Crystal Palace on 12 August, but had not won or even scored an away goal since. That goalless and winless run - which consisted of seven Premier League games and a Carabao Cup tie - ended in style at Vicarage Road, although each of their opening three goals had an element of good fortune. Kachunga finished from close range after Watford had failed to clear a corner for the opening goal, but Kachunga had looked to be in an offside position before he steered in Quaner's effort. Quaner was again involved in the build-up to the second - his cross from the byeline hitting Mooy, who did not know too much about it. And for the third goal, Holebas slipped in the penalty area to allow Depoitre to finish. But there was no luck needed for the fourth goal as Mooy dispatched a well-struck penalty after Doucoure's trip on Depoitre for his second of the afternoon. The only down side for Huddersfield were first-half injuries to Kachunga and Chris Lowe. Terriers boss David Wagner said Kachunga's knee injury "looks serious" and came as he tried to get on to a cross, but appeared to kick the ground and landed badly before he was carried off on a stretcher. For the third successive game - and for the fourth time this season - Watford were reduced to 10 men. Deeney was dismissed after only 33 minutes for a rash lunge at Quaner, who was near the touchline trying to shield the ball from Etienne Capoue and not in a dangerous position. The Hornets captain argued he did not deserve a red card, but is now set to serve a three-game ban - meaning he will miss the away game at Brighton on 23 December and then home matches against Leicester on 26 December and Swansea four days after that. No side has had more players sent off than Watford this season - Deeney's red card following dismissals for Marvin Zeegelaar and Tom Cleverley against Burnley and Crystal Palace respectively earlier this month, and Miguel Britos against Brighton in August. Watford's Twitter account called the decision to send off Troy Deeney "incredibly harsh"
Watford also had Holebas sent off in a Carabao Cup tie against Bristol City in August and boss Marco Silva will surely be concerned with his side's disciplinary record. The Hornets were handed a way back into the match when Hogg was dismissed for two bookings after fouls on Andre Carillo and Richarlison. Doucoure's spectacular strike gave them hope of an incredible fightback, but Watford could not build on that as their winless run now extended to five. This was the first top-flight meeting between Watford and Huddersfield. The Hornets are winless in their past five league games, losing four of them. The Terriers had equalled a club record of seven away league games without a goal since they won 3-0 at Crystal Palace on the opening day of the season, before scoring four on Saturday. Kachunga's goal ended Huddersfield's run of 59 consecutive shots away from home in the Premier League without scoring. Watford have the most Premier League red cards this season (four) and also the most since the start of last term (nine). They are the first team to be given a red card in three successive Premier League matches since West Ham in August 2015. Huddersfield manager David Wagner: "We were focused on defence and good in offence. Watford have problems at the minute with suspensions and injuries. "They are a top team - but we were good as well. We always had the feeling this was just around the corner. On Hogg's red card: "I would say if Watford didn't get the red card I am unsure if we would get a second yellow for Hogg. We have to accept it. This game is too great for us to discuss referee decisions." Watford manager Marco Silva: "The result is bad for us. At this moment, what I can talk about and what I want to talk about is congratulating our opponent. We need to keep working hard. The past two games we can't change - but we can change the next. This is the moment to look forward and continue to work hard. "I cannot talk about the attitude of the players. We reacted with 10 players. It is not a matter of attitude or commitment it is about the moments. We should do and must do better in situations. "I am 100% happy with my job. The Premier League is 38 games not only 10. We need to keep going and to work to take results in the next game. You need to react to bad moments." On whether the Hornets have a disciplinary problem: "No. It is the same as with the first goal. You ask me about that because you know what happened. And you know what happened with the red. I don't want to talk about officials. Watford are at Brighton in the league on Saturday, 23 December (15:00 GMT kick-off), with Huddersfield away at Southampton at the same time. Attempt saved. Roberto Pereyra (Watford) right footed shot from the centre of the box is saved in the top right corner. Attempt missed. Laurent Depoitre (Huddersfield Town) header from the centre of the box is too high. Assisted by Tom Ince. Attempt blocked. Collin Quaner (Huddersfield Town) right footed shot from the centre of the box is blocked. André Carrillo (Watford) wins a free kick on the left wing. Foul by Scott Malone (Huddersfield Town). Tom Ince (Huddersfield Town) wins a free kick in the defensive half. Goal! Watford 1, Huddersfield Town 4. Aaron Mooy (Huddersfield Town) converts the penalty with a right footed shot to the bottom left corner. Penalty conceded by Abdoulaye Doucouré (Watford) after a foul in the penalty area. Penalty Huddersfield Town. Laurent Depoitre draws a foul in the penalty area. Corner, Huddersfield Town. Conceded by Heurelho Gomes. Attempt saved. Tom Ince (Huddersfield Town) left footed shot from the left side of the box is saved in the top left corner. Assisted by Danny Williams. Foul by André Carrillo (Watford). Scott Malone (Huddersfield Town) wins a free kick on the left wing. Corner, Huddersfield Town. Conceded by Roberto Pereyra. Substitution, Watford. Stefano Okaka replaces José Holebas. Corner, Huddersfield Town. Conceded by Sebastian Prödl. Attempt blocked. Aaron Mooy (Huddersfield Town) left footed shot from the left side of the box is blocked. Assisted by Scott Malone. Attempt blocked. Daryl Janmaat (Watford) header from the centre of the box is blocked. Assisted by José Holebas with a cross. Corner, Watford. Conceded by Zanka. Attempt missed. Richarlison (Watford) right footed shot from outside the box misses to the right. Assisted by Abdoulaye Doucouré. Attempt missed. Andre Gray (Watford) right footed shot from the right side of the box is close, but misses to the left. Assisted by André Carrillo. Attempt blocked. Richarlison (Watford) right footed shot from the left side of the box is blocked. Assisted by Roberto Pereyra. Offside, Watford. José Holebas tries a through ball, but Richarlison is caught offside. Corner, Watford. Conceded by Laurent Depoitre. Corner, Watford. Conceded by Scott Malone. Laurent Depoitre (Huddersfield Town) is shown the yellow card. Goal! Watford 1, Huddersfield Town 3. Abdoulaye Doucouré (Watford) right footed shot from outside the box to the bottom right corner following a set piece situation. Foul by Collin Quaner (Huddersfield Town). Attempt saved. Roberto Pereyra (Watford) left footed shot from the right side of the box is saved in the bottom left corner. Attempt blocked. Daryl Janmaat (Watford) left footed shot from the centre of the box is blocked. Assisted by Abdoulaye Doucouré. Attempt missed. Sebastian Prödl (Watford) header from the centre of the box is too high. Assisted by José Holebas with a cross following a corner.